OK... I tried this recipe the last weekend and all I can say is it works great!!!! I smoked breast and thighs using it and they turned out excellent and that is a compliment as I am NOT a fan of any kind of chicken. But this is one type of chicken I will eat!!!! Whipper-- thanks for sharing. If I were smart enough I would insert pictures. I wonder if there would be any difference using this brine on split chicken halves. I like the sounds of that brine......been lookin' for a good one recently. Thanks!! Chicken pieces only take 1-2 hours in the brine. Whole chicken is an hour per pound in the brine. Pork really works well brined as well. Spares come out extra juicy and flavorful. A rack of spares only takes about 2 hours in the brine. Make sure you rinse them off after brining, and leave the salt out of the rub. The secret to brining is the salt to sugar to water ratio. Low salt brine will not have the same chemical reaction on the meat proteins. Here's an all-purpose recipe from Cook's Illustrated magazine that works well with chicken and pork. This also shows your salt conversions, very important. If you want the theory behind brining to work make sure you use the correct amount of salt. Kosher salt and table salt measure out complete different. Also use unionized salt. Mix in a non-reactive container until dissolved. Substitute 1/4 cup + 2 TBSP Morton Kosher Salt or 1/4 cup table salt for Diamond Crystal. Make 1 quart of brine for each pound of meat, not to exceed 8 quarts (2 gallons). Soak meat for 1 hour per pound, but not less than 30 minutes or longer than 8 hours. If brining multiple pieces, base the brining time on the weight of an individual piece. 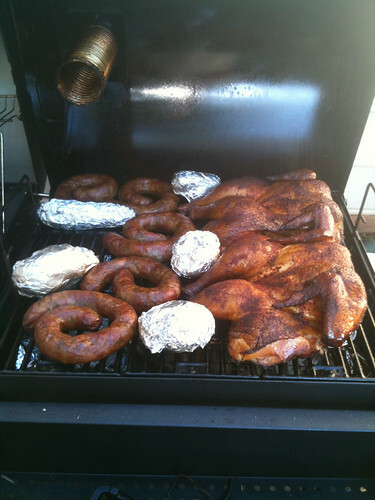 To help answer the question of the red/pink joints and bones, it�s the smoke that turns chicken bones that color. If you are using apple wood you will have even a more pronounced red in the joints and bone. Looks like a great dish Whipper I am looking forward to trying it out. great recipe. Ive tried i with my friends and they all love it. Heres an idea, last time I did one bird with a dark beer and the other with a non-alchoholic fruit beer. They both were good but my friends said that the fruit beer one was better. I havent tried it because I was making thank you chickens for my friends and took the oportunity to have them do a taste comparison. I cant think off hand what america has similiar to that but im glad i tried other things. I tried this recipe last night as well. Smoked it with mesquite. juicy and tender with a great taste. I didn't have cumin on hand for the rub so I substituted poultry seasoning. I also used turbino sugar instead of dark brown sugar. My girlfriend who doesnt like chicken said she is gonna have to ask me to make this again. Thanks for the recipe. I tried this last night in pursuit of my quest for consistently good skin...I had my WSM at 325* when I put the bird on and cooked it for about an hour to 170 internal. The flavor was great but once again tough skin. This is getting frustrating! I don't think I've ever been able to smoke a bird (chicken or turkey) where the skin was salvageable for eating. Tough as leather. I just save the skin for the dog.. Tried this yesterday on my day off. Made it for my mother and father in law and my wife. WOW!!!!!!!!!!!!!!!!!!!!!! It takes a big dump on beer can chicken that's for sure. I was blown away by how moist and flavorful the meat was.....amazing! I can't wait to try it again. I made the chicken, smoked mashed potatoes, KFC (yes I cheated on the coleslaw) coleslaw, and apple cobbler for dessert. It was pretty good Thanks for the recipe!! Couple of thoughts, having written Brining 101 I follow brining posts closely, hope you don't mind me adding some thoughts. I think the pieces for only 1 or 2 hours is a personal taste and depends on the size and the type of meat. Dark meat takes longer (denser proteins). Bone in breast take longer than boneless (brine penetrates all sides easily in the boneless. Low salt brine will not have the same chemical reaction on the meat proteins. technically true, but what it really means is that you can do a low salt brine, it will just take longer for it to do it's magic.Brines denature the proteins and the length of time as well as the % of salt really matter. If that were true, the meat would all be pink. When the bone side is pink or red and the meat is white, it's not from smoke penetration. Red bones can be a side effect of hormone grown chickens. The bones become brittle and the meat will become read from leakage from inside the bones. I've cooked chicken to 180 and still have "blood red" near the bones. A couple of the Tyson chickens seem to always have this happen. It's not from smoke and it's not from being undercooked. There's some really good articles on the internet about this, some with photos, so maybe someone has that link. Great recipe and the chicken came out super juicy and flavorful. I brined the birds overnight. I also have some homemade Polish Sausage on that we usually boil. It was a nice change smoking it. Has anyone tried this brine/rub/smoking procedure on a turkey? Can someone tell me why I can't see the original measurements? Depending on the browser I use I can only see a question mark or a empty box??? HALP! I want More beer Brined Chicken! Didn't have all the ingredients for the rub so I just used something else. But I did the brine for 6 hours and I can see/taste a difference, I like it. 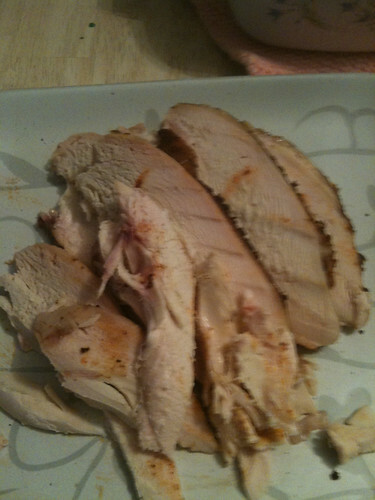 \It's hard to get flavor into chicken and this helped alot, I will be doing it again. I have tried marinating, injecting, tons of seasoning but it seems brining gets flavor more into the chicken than anything I have tried before. Used this recipe on 4 chickens this weekend. Every single one of them was amazing!! Thanks for this recipe. I did 2 4.5lb chickens this weekened using this recipe but slightly modified. I used 2 whole bottles of Sam Adams Octoberfest, along with some other seasonings to give it a bit more spice. I marinated for a full day. For the rub I used my modified Memphis Dust rib that I added a little more brown sugar and some chilie pepper to. Rubbed the chicken down well and smoked with Mesquite at 250* until interal temp was 190*. I really planned on this cook being about 4.5hours but in reality I hit 190*s in about 2.5-3hrs which I found very odd, but temp is temp. All my guest said this was by fair the best chicken they have ever had. IMO this blows beer can chicken out of the window. I will certainly use this reciepe again, though the next time I am thinking about serving one chicken with sauce and the other dry rubbed.